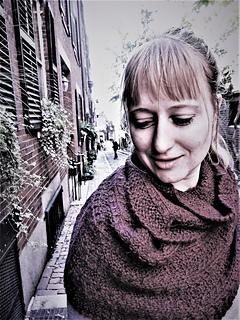 This Beacon Hill Infinity Scarf is a quick and easy pattern with a seamless construction. 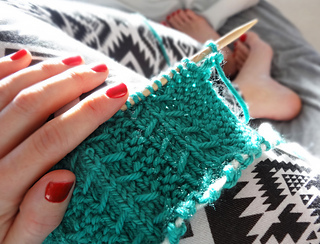 You will find that you can memorize the stitch texture within a couple of repeats! Yarn: less than 320yds or 200g of a lighter weight bulky yarn (pattern seen in Mirasol Yarn Miski, 100% Baby Llama fiber in shade 107). An alpaca wool blend is a nice substitute. 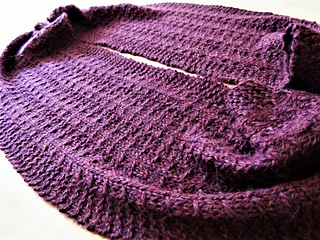 CO= cast on K= knit P=purl St(s)= stitch(es) RS= right side WS=wrong side BO=bind off RH= right hand Sl= slip st (purl-wise) WYF: with yarn in front. This strand will loosely wrap around 5 sts. KWNUS (k with needle under strand): insert RH needle under the loose strand, wrap and k the next st, so that the loose strand is now behind that k st. See picture tutorial on last page. 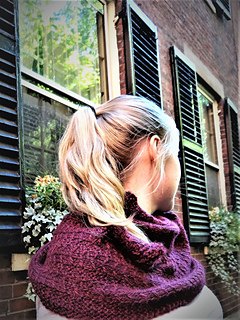 The infinity scarf is k flat, using an invisible CO method so that both ends of the scarf are grafted together after the blocking process. There will always be a Garter St (knit only) border of 5 sts on the right and left side of the scarf, which is already included in the written pattern and on the chart. 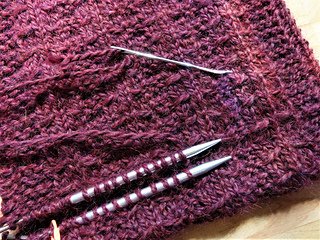 For a cleaner edge, sl the first st of every row purl-wise. If you are using synthetic fiber, skip the blocking phase. Instead, k the scarf to approx. 50-55,’’ cut the yarn, leaving a 20’’ tail, and continue to the Kitchener St sewing instructions. The infinity scarf is long enough that you loop it twice around your neck. 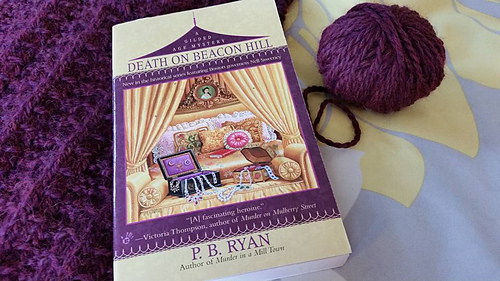 If you wish for a quicker project, feel free to knit half the length (25’’ or so inches long).